We headed out on a friends boat and were in the water at around 7 at Pineland Marina. On the way out the conditions were much choppier than expected along with the thunderstorms in the distance. In 30' of water his one pin spot was completely decimated as it is fairly close to shore. Went to about 50' and loaded up with the pins and continued on out to the barges. At the barges we were greeted with green water, we set up for snapper but with no luck nothing. We sent out a crab and was immediately bombarded by 4 permit. They got the crab and we missed two permit there. We decided to go grouper digging, where we picked up a nice 30" at one spot. The grouper bite was very tough to say the least. After moving around quite a bit we headed towards the fantastico. Set up for the snapper and there they were along with maybe 100 big blue runners that we caught at least 30 of. We pulled in a nice group of about 18 yellowtails ranging from 13" up to 18". Most of the tails were all caught on shrimp with a few off squid. We used 25lb yozuri flouro and 1/8oz jig heads. Later on, I set out a crab under a balloon and it was nailed by a nice 37" TL permit. Managed to land it, and in came two bull sharks that stayed in our chum slick. We decided to call it a day and head back in to where we were greeted by those nasty thunderstorms. On the way in, I checked the weather and it said wind gusts up to 50 mph were expected. So we made it back in safely while dodging lightning. 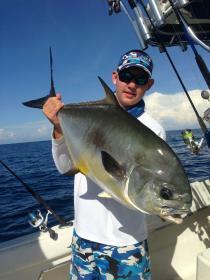 Nice looking permit, thanks for the report. Seeing thunderstorms on the way back in is always anxiety provoking! Thank you for the report Veikx Glad to see you got out on the water . Super permit - must have been a battle. Nice permit, where do you get your crabs? We pick them up usually at Anderson's bait and tackle. But when we are out there just keep an eye out for crabs. We picked up about 6 floaters for free out there. Great report and picture. skilled fisherman to be sure. Glad you all made it home safe. What do you mean you keep an eye out for them? how the heck do u spot a little grab doing 30+ mph? Certain days when it's glassy it's easy, we throw a little marker, bright orange foam or something when we see them running. Or when we a moving from spot to spot at a small distance you can see them swimming at the top. They ripple the water when they swim so it's distinctive . I wanna try for permit with my sons. Do you normally just free spool the crab with no weights? I'm thinkin of doing a small jig head 1/8 oz. It all depends, if you can see a school of them swimming around I would first try free lining a crab. If nothing then try putting a balloon about 5-6' in front the the little guy and sending it back about 100' or so. Also we are using heavy tackle, too many bull sharks and goliaths that might want dinner so we try to horse them in. Would be interested in hearing this as well. Never fished for permit and would love to catch one.